Given the higher cruising speed (and frequently altitude) of multiengine airplanes over most single-engine airplanes, the descent must be planned in advance. A hurried, last minute descent with power at or near idle is inefficient and can cause excessive engine cooling. It may also lead to passenger discomfort, particularly if the airplane is unpressurized. As a rule of thumb, if terrain and passenger conditions permit, a maximum of a 500 fpm rate of descent should be planned. Pressurized airplanes can plan for higher descent rates, if desired. In a descent, some airplanes require a minimum EGT or may have a minimum power setting or cylinder head temperature to observe. In any case, combinations of very low manifold pressure and high rpm settings are strongly discouraged by engine manufacturers. If higher descent rates are necessary, the pilot should consider extending partial flaps or lowering the landing gear before retarding the power excessively. 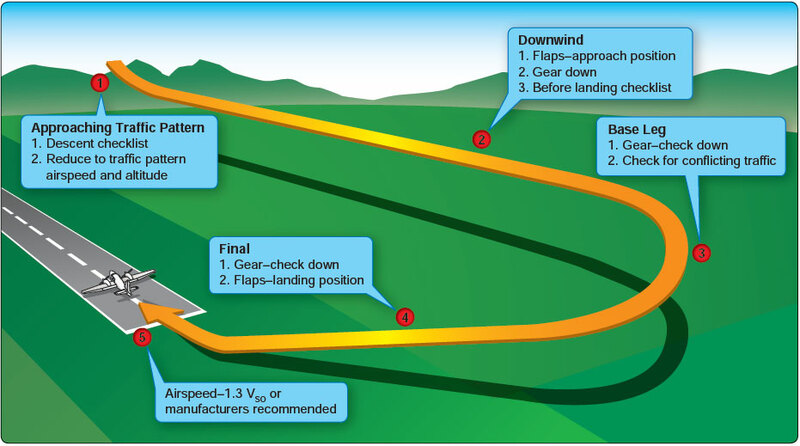 The Descent checklist should be initiated upon leaving cruising altitude and completed before arrival in the terminal area. Upon arrival in the terminal area, pilots are encouraged to turn on their landing and recognition lights when operating below 10,000 feet, day or night, and especially when operating within 10 miles of any airport or in conditions of reduced visibility. The FAA recommends a stabilized approach concept. To the greatest extent practical, on final approach and within 500 feet AGL, the airplane should be on speed, in trim, configured for landing, tracking the extended centerline of the runway, and established in a constant angle of descent towards an aim point in the touchdown zone. Absent unusual flight conditions, only minor corrections are required to maintain this approach to the round out and touchdown. In the round out for landing, residual power is gradually reduced to idle. With the higher wing loading of multiengine airplanes and with the drag from two windmilling propellers, there is minimal float. Full stall landings are generally undesirable in twins. The airplane should be held off as with a high performance single-engine model, allowing touchdown of the main wheels prior to a full stall. Under favorable wind and runway conditions, the nosewheel can be held off for best aerodynamic braking. Even as the nosewheel is gently lowered to the runway centerline, continued elevator back pressure greatly assists the wheel brakes in stopping the airplane. If runway length is critical, or with a strong crosswind, or if the surface is contaminated with water, ice or snow, it is undesirable to rely solely on aerodynamic braking after touchdown. The full weight of the airplane should be placed on the wheels as soon as practicable. The wheel brakes are more effective than aerodynamic braking alone in decelerating the airplane. Once on the ground, elevator back pressure should be used to place additional weight on the main wheels and to add additional drag. When necessary, wing flap retraction also adds additional weight to the wheels and improves braking effectivity. Flap retraction during the landing rollout is discouraged, however, unless there is a clear, operational need. It should not be accomplished as routine with each landing. Some multiengine airplanes, particularly those of the cabin class variety, can be flown through the round out and touchdown with a small amount of power. This is an acceptable technique to prevent high sink rates and to cushion the touchdown. The pilot should keep in mind, however, that the primary purpose in landing is to get the airplane down and stopped. This technique should only be attempted when there is a generous margin of runway length. As propeller blast flows directly over the wings, lift as well as thrust is produced. The pilot should taxi clear of the runway as soon as speed and safety permit, and then accomplish the After Landing checklist. Ordinarily, no attempt should be made to retract the wing flaps or perform other checklist duties until the airplane has been brought to a halt when clear of the active runway. Exceptions to this would be the rare operational needs discussed above, to relieve the weight from the wings and place it on the wheels. In these cases, AFM/POH guidance should be followed. The pilot should not indiscriminately reach out for any switch or control on landing rollout. An inadvertent landing gear retraction while meaning to retract the wing flaps may result.